Turbaned and bejeweled Kashmiri princes recline on soft nan pillows, sipping chai as servants scamper over rugs of a luxuriant weave and between silk curtains rippling and fluttering in the light breeze of a Srinagar palace pavilion. 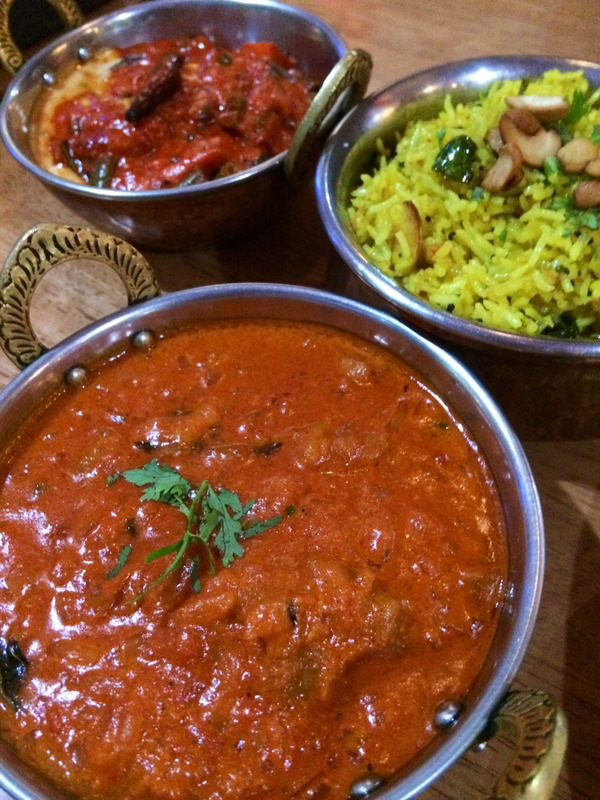 Authentic curry is a heady experience. It’s all about piquant flavors, bracing chili heat and a couple of cold pilsners. It begins with those heavy aromas wafting through the air and sparking your synapses. And it ends, inevitably, with a large chair and an evening of gentle, amusing burps. 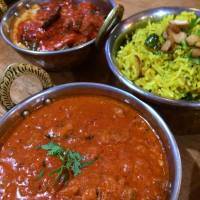 Key to this gastronomic bliss is the subtle combinations of spices used in Indian cooking — how they make it possible for even the most veteran aficionado to find something new in a cuisine they thought familiar. Everyone’s got their safety order, of course (mine’s a lamb dopiaza), but there’s always something on the menu for when you feel like going off-piste: yams with Keralan gravy, a dry mutton biryani or the tangy, toasty Meen Kulambu. Or vindaloo for the irredeemably sadistic. 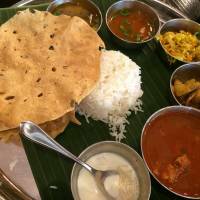 In this month’s column, I’ve tried to bring you a few of the best spots to explore some of the rich, complex heritage of Indian cuisine, and escape the bland and oversimplified offerings of the Japanese curry shop and those faux-traditional places, usually clad in dark wood, that try to fob you off with “yellow rice,” dinky gravy boats and swirls of cream. A good place to start if you’re looking for something new is in the depths of the cavernous Dhaba India (1F Sagami Bldg., 2-7-9 Yaesu, Chuo-ku, Tokyo; 03-3272-7160; www.dhabaindia.com), which despite its limited menu offers some of the best South Indian cooking in town. Packed out as it is with office workers at lunch and couples in the evenings, it’s best to book in advance. But if you can’t, then allow yourself to be distracted as you wait by the charming chaos in the tiny kitchen tucked away at the back, where you’ll see five Indian chefs constantly stepping over one another with pots and pans and conspicuous mustaches. When you do get a table, try the masala dosa, a giant pancake rolled and stuffed with spicy potato and onions. Tear a piece off and dip it into the small bowls of hot sambal relish and sweet mashed coconut, or the tart smear of ginger paste, served alongside it. There’s also excellent chicken tandoori for those who know what they like, while for the more adventurous, the Tamil fish pulusu filled with generous chunks of cod offers a spicy, sour, slightly creamy taste experience that falls somewhere between a lobster bisque and tom yam soup. 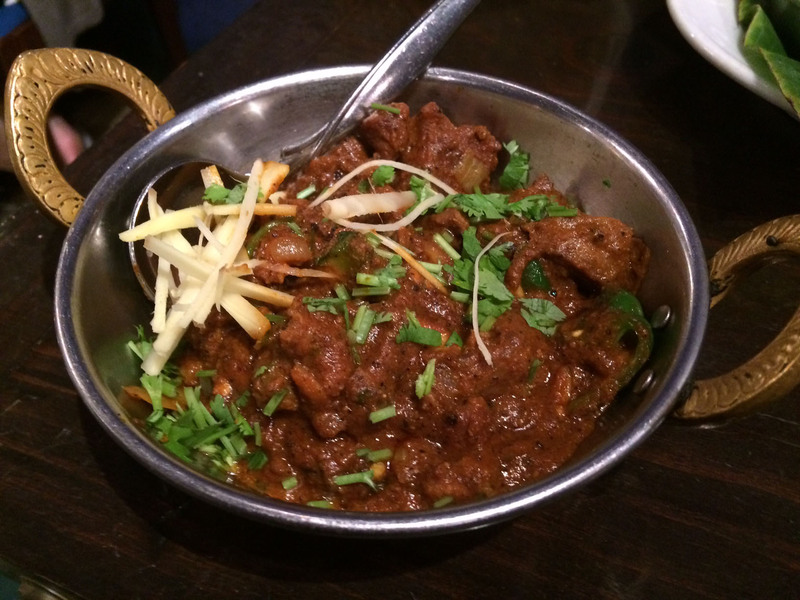 And don’t be put off by the dry mutton curry either — it’s a rich and glossy affair with earthy aromas of cumin, black pepper and cardamom that are set off with a light sprinkling of shaved ginger and fresh coriander. Authentic Nirvanam (2F Ote Bldg., 3-19-7 Toranomon, Minato-ku, Tokyo; 03-3433-1217; www.nirvanam.jp), just a stone’s throw from Tokyo tower (and with another branch up the road in Kamiyacho), is another gem, though less showy than Dhaba. The staff here push Keralan parota flat bread over nan, and the list of vegetarian dishes from Hyderabad, Kerala, Goa and Tamil Nadu is practically longer than my arm. 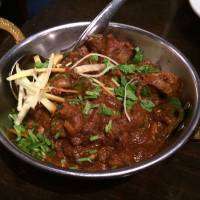 Add the number of Indian diners eating there, and you’ve got hard evidence that the chef not only knows his regional cooking, but also how to create flavor without relying on meat. There are chicken and mutton offerings (the chicken Chatinard is popular), but I’d advise you to pass. Instead, pique your appetite with a revitalizing rasam soup. After a pause, step up to the fiery vegetable Hyderabadi, or if you’re into earthy cumin and ginger flavors, the dal palak (garlicky lentil and spinach curry). To round out, I’d recommend a parota or two, and if you can manage it, the wonderfully scented and fragrant lemon rice, with its perceptible flavor of sweet sauteed onions and toasted cashew nut topping. Another option is utilitarian Anhdra Kitchen (3-20-2 Ueno, Taito-ku, Tokyo; 03-5818-6564; www.andhra-kitchen.com), which has a basic, no-frills vibe and is a great place to grab lunch. 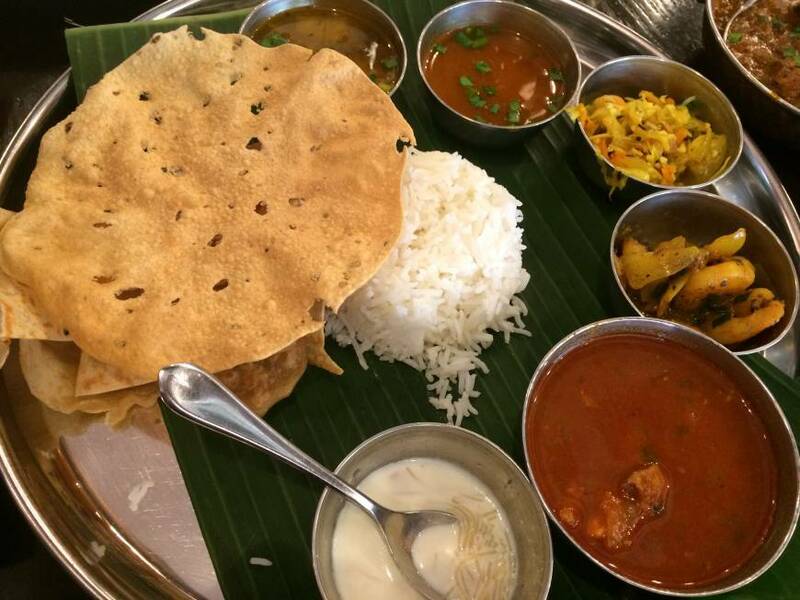 The set course for ¥1,290 gets you two curries as well as a vegetable poriyaru (stir-fry), a side of rasam, chapati, rice, poppadum and pickles, and a glass of lassi, all served on a great big banana leaf. As part of your selection, you might want to try the royyala iguru, a classic dish from Andhra Pradesh packed with a generous amount of green chilis and pickled gongura leaf. A la carte, the golden crispy onion uttapam, a thick pancake finished with ghee, is a joy, while the mint-mix gosh sheek kebab is as much fun to eat as it is to say. If all this has you reaching for the cookbook, but your cupboards are curiously devoid of ghee, basmati or chili lime pickles, Indojin (www.indojin.com) can sort you out with all the essentials, right down to the flour for the chapatis and lentils for the rasam, and deliver it anywhere in the country. But before you offer your masterpiece to the world, take a moment to reflect on the three golden curry rules: 1. Having a fridge stocked with crisp, hoppy ale is a duty (my tip: Jever or Wurzburger Hofbrau pilsner). 2. Things are going to get messy anyway, so nothing but minimal cleaning is really necessary. 3. If you can move afterward, you’re just not doing it right. Alex Dutson is a buttery young gentleman from Yorkshire, England, whose critiques of onion gravy are revered the world over.